The Rev. Mike Slaughter, front, speaks at the 2012 General Conference in Tampa, Florida. “I support the One Church Plan, but if we can’t agree to disagree, I would support a gracious exit plan that is just,” Slaughter said recently. Photo by Mike DuBose, UMNS. 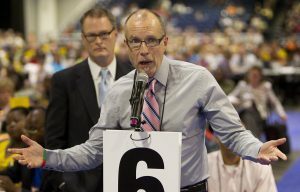 Recent statements from two different groups portend an agenda of institutional survival taking precedence over resolving the conflict in The United Methodist Church at the upcoming General Conference. 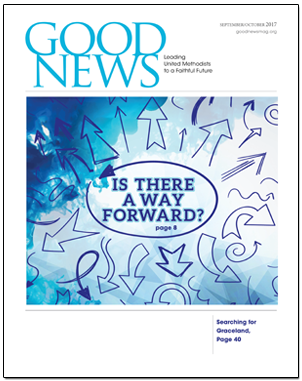 Many across the theological spectrum (including many members of the Commission on a Way Forward) have previously said that a gracious exit path for congregations to leave the denomination with their property would be necessary regardless of which plan General Conference adopted. Now, some leaders are pulling back from that position in an attempt to coerce churches into maintaining the current institutional structure. Reconciling Ministries Network, a pro-LGBTQ organization in the UM Church, recently posted a statement on their Facebook page that demonstrates the level of hypocrisy or denial it takes to try to preserve a broken institution. They state, “Already built into The UMC are ways to leave the Church agreed upon by the Church.” That is only partly true. The Discipline contains a provision allowing an annual conference to deed a local church property over to “another evangelical denomination.” The conditions for such an action would depend upon whatever the annual conference chooses to impose upon the local church. Some congregations have not been allowed to leave with their building at all, despite the fact that over 90 percent of the members voted to withdraw. Other congregations have been asked to pay large sums to keep their property. The local church is at the mercy of the annual conference, which can choose to be gracious or play hardball in what they require. What congregations are asking for is a fair, gracious, and standardized exit path that assures them there is an equitable way to keep their property. It is helpful for United Methodists to keep in mind the congregations of brothers and sisters who have attempted to depart from other mainline denominations over issues of marriage and sexuality. The legal fees spent by the national Episcopal Church exceeded $45 million, not including what local churches spent. Presbyterian churches spent millions, and found that the disparity between different presbyteries (equivalent of our annual conferences) in how they treated departing congregations created unfair and often punitive and adversarial conditions. We can learn from their experiences and do better. Finally, the statement says, “Plans for so-called ‘gracious’ exit are plans for schism, dissolution, and disobedience to the mission of the Church.” It is highly ironic that those causing the schism in United Methodism are now blaming those who want a fair and gracious exit path for fomenting schism. It goes beyond irony to arrogance for those who are currently disobeying the United Methodist Discipline and covenant to be charging those who want an exit path with disobedience. On the contrary, those desiring an exit path want the church to provide that so the congregation desiring to depart is NOT being disobedient in choosing to do so. Evangelicals and traditionalists have consistently operated within the boundaries of the Discipline. Those who have fomented this crisis through their own disobedience have no standing to call others schismatic or disobedient, nor to prevent congregations from living out their Christian faith and mission in a way that is faithful to their conscience. Only slightly less objectionable is a statement from Uniting Methodists, a newly formed caucus group advocating for the One Church Plan, calling for all exit paths to be referred to the 2020 General Conference. “It’s clear that the first priority for the Body of Christ is always to search for unity rather than division,” said the Rev. Dr. James A. Harnish, spokesperson for the group. While unity is indeed a value for followers of Jesus Christ, there are other even higher values. Values like remaining in Christ (John 15:5), allowing the Word of God to remain in us and bear fruit in our lives (John 15:7), and keeping Christ’s commandments (John 15:10). Faithfulness and obedience to God’s will take precedence over unity. Fostering a “pretend” unity through structural coercion is an unhealthy approach to resolving our crisis. Traditionalists are not “searching” for division, but recognizing the division that already exists and the practical impossibility of continuing structurally united with those who deny the teachings of Scripture and disrespect our United Methodist identity and covenant. Harnish further maintains, “Action on exit plans are [sic] not consistent with the primary purpose for establishing the Commission on a Way Forward.” However, if one reads the motions adopted at the 2016 General Conference, they do not anywhere mention preserving the unity of the church. Instead, they reference ending or resolving our conflict and providing a way for the church to move forward. We all wish that we could find a way forward that would preserve the unity of the church. But the deep theological divide and unwillingness of some to submit to our agreed-upon covenant makes unity impossible without repentance and a change of behavior. Harnish’s final reason for postponing action on exit paths is “Delegates will not have adequate time to gather all of the facts, understand the consequences, and participate in thoughtful debate.” These proposals have been publicly before the church for seven months. Much ink has been spilled with writings on all sides of a complex issue. Delegates have had ample time to study the proposals and understand the possible consequences. If the delegates are not ready to act now, they never will be. Proposals for exit are found in seven of the 78 petitions to be considered. Only two of them need to be enacted (one from the Modified Traditional Plan allowing transfers out by annual conferences and congregations and one exit path for individual congregations). One of those proposals already passed a legislative committee in 2016. In 2020, General Conference will be considering hundreds of petitions spanning dozens of topics. Despite having more days of sessions, the delegates would not have any more time to focus on the exit paths than they do in 2019. Even some Uniting leaders have publicly supported an exit path. According to a UMNS article, “the Rev. Mike Slaughter, pastor emeritus of Ginghamsburg United Methodist Church, agrees that exiting the denomination should be done with grace. Uniting Methodists’ call to refer the exit path petitions to 2020 is a way to kill those proposals or, at best, once again “kick the can down the road.” If the One Church Plan is adopted, many proponents undoubtedly want to coerce traditionalists into staying in the church so that proponents can continue to try to change our minds while benefiting from our continued financial support of the institutional structure. Our church has reached a decision point on ministry with LGBT persons. Our lay members will not withstand another delay in resolving a crisis that is severely damaging our church’s ability to make disciples of Jesus Christ for the transformation of the world. Delaying any exit path would only exacerbate the conflict in our church, not resolve it. The question is, do our leaders care more about enabling our church to move forward in effectively carrying out our mission, or about trying to preserve an institutional structure? If the latter, our denomination will continue to decline and the kingdom of God will lose. Here, another saying of Jesus is instructive. “I tell you the truth, unless a kernel of wheat falls to the ground and dies, it remains only a single seed. But if it dies, it produces many seeds” (John 12:24). We need to be willing to surrender our instinct for institutional self-preservation for the sake of allowing the church to move into a healthier place. We cannot continue to operate in the current way and expect to see fruitful ministry in the years ahead. A healthy institution would allow those who can no longer conscientiously participate in the institution’s mission to amicably withdraw and pursue their own mission as they perceive it. Anything else is simply an institutional power play. The strategy of the losing side is always to put the decision off to another day when more facts are known. What apparently escapes them is that the more conservative members are leaving in droves for lack of a decision. If Jesus would not do it then it is not Christian, and if John Wesley would not do it then it is not Methodist. The UMC will either reaffirm its roots and survive or the result will be a once great church in freefall. TRUST. Progressives can trust traditionalists to be consistent and stand by their word. Traditionalists are very predictable. Therefore, they are certainly more vulnerable to attack and criticism as being stubborn, reactionary, and uncompromising from a worldly perspective. On the other hand, traditionalists cannot trust progressives to be consistent and stand by their word because they have a lengthy history now of not doing that. Being inconsistent and breaking their word has become their calling card. Besides, that would violate the rules by which they play, wordly rules. Progressives have evolved their multiple positions on homosexuality and marriage over these past 45+ years, positions that are in continuous revision that follow cultural trends while appearing reasonable, enlightened, and informed from a worldly perspective. Their positions are guided by the changing culture — which is their rule book. Traditionalists have maintained a clear, concise, and consistent position over these past 45+ years based on the Word of God, their rule book, which does not evolve and change with coming and going cultural movements and trends. So, our delegates must decide if they want to revise our Book of Discipline to conform to the progressives’ rule book and methods or keep and strengthen our Book of Disciplne and remain aligned with God’s rule book. And this certainly would include the Golden Rule with relation to a generous exit path. I have been a lay member of the United Methodist Church for 32 years but consider myself to be foremost a member of Christ’ Universal Church. Witnessing the conflicts that have plagued the UMC for decades I have come to believe that the United Methodist Church as an institution may have reached its expiration date. The UMC may have had a fatal flaw from its creation. I do not see it surviving in its present form. I am disappointed that much of the current debate is focused on the survival of the United Methodist Church as an institution. Institutions, however, are not important, they come and go. During my working life I have experienced several upheavals where once proud companies fall and are replaced by newer ones. It is the cycle of living organisms to grow old and die only to be replaced with newer ones. This is true of organizations as well. As sad as the passing of the United Methodist Church might be we know that Christ’s Church will continue in other forms. We must never confuse fidelity to an institution for fidelity to God. We are to remain true to Biblical teaching and faithful to Christ. “another evangelical denomination.”- where in the BOD? Book of Discipline, Par. 2548.2. You can’t kick a can but so far down a dead end road!! Tom sets forth the matter succinctly, saliently, and ominously. Here is the case in a nutshell: “If the One Church Plan is adopted, many proponents undoubtedly want to coerce traditionalists into staying in the church so that proponents can continue to try to change our minds while benefiting from our continued financial support of the institutional structure.” There will not be escape hatches provided if the One Church Plan is adopted. Expect dirty tricks. Well, of course the escape hatch then would be to walk into a new denomination and either purchase facilities or build them on a congregation by congregation basis. Likely the abandoned properties that the liberals would end up with would soon be on the market at substantially reduced prices, and maybe pass back into the hands of some of their original owners. Whatever they could get for these properties would maybe keep them afloat for a couple more years.